The expression ‘Shop till you drop” would never be an exaggeration when you visit Rajasthan. Although expensive, but Rajasthan is truly shoppers' paradise. The place has won the hearts of countless people by virtue of every single thing, be it art, culture, beauty, heritage, history and even its indigenous products. Although the directory of things that you can buy from this desert state of India is endless, but the following discussion would highlight on a list of ten most expensive items available in Rajasthan. Rajasthan is famous for its jewelry. Although expensive, but you just cannot restrain from getting some for you and your dear ones. Rajasthan has carved a special position for itself by virtue of Lac bangles, Kundan work and Meenakari, enameled gold jewelry, emerald-cutting and also uncut diamonds. One of the most exclusive art is 'Thewa' from Chittaurh which is popular for its gold work on glass. A few conventional adornments include Rakhdi or head ornament, Baju Bandh or armlet, Tussi or necklace, Gokhrus or bracelets, Adah or special necklace worn by Rajputs and Pajebs or anklets. Ever since the Mughal era, Thewa jewelry has been popular in Rajasthan. Being made out of a very unique technique, this style of jewelry is embossed with gold sheets on molten glass. You could try out the wide array of designs and patterns that look exquisite and extraordinary. 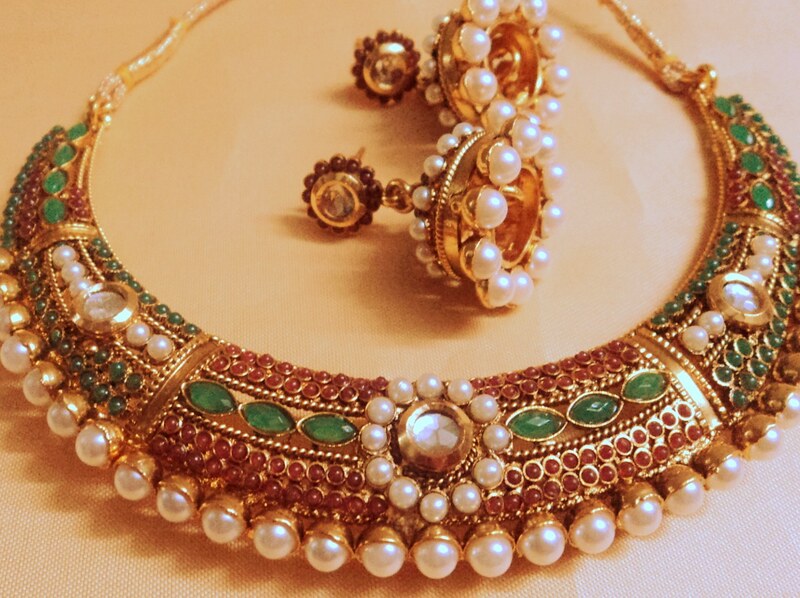 Kundan jewelry is a particular style found in Jaipur which is especially worn on festive occasions. Polished gem stones are artistically set in gold or other metallic base in a designed manner and Kundan jewelry is thus made. Meenakari is the most significant style of Rajasthani jewelry. Introduced to Rajasthan by Raja Mansingh of Amer, this style of jewelry is extremely expensive. Jadau jewelry had hailed from the Mughal period and had been made in Rajasthan ever since. When it comes to occasions like weddings and other celebrations, the Jadau style of jewelry made with different kinds of crystals, gems, semi-precious stones, precious stones and beads are worn with great delight. Pratapgarh jewelry has developed its unique way of enamel work which led to the birth of new style of jewelry. The enamel work is found to be done with gold or silver where colored glass pieces are used as the base. Lac jewelry of Jaipur, Jodhpur and Udaipur has earned name and fame all over the world. Lac bangles are believed to be good omen and are available in a great variety of designs and colors. The desert state of Rajasthan is a land of vivid colors and artistic excellence. In order to offset the dullness of the sandy surroundings, bright colors are used to emphasize the vibrancy of the place and the lives of the people. Hence, even mud walls are painted in green or red. Whether it is about the dresses or the accessories, every single thing in Rajasthan is colorful and vibrant. Marble in Rajasthan is a special attraction and one of the expensive items for purchase. Interesting things are made out of marble for the purpose of gifting to near ones who can have an idea of the art of Rajasthan from the exclusive souvenir. The people of Rajasthan believe that gifting marble would be especially significant since marble would stand for purity and impermeability. The textiles of Rajasthan are so vivid that you could hardly take your eyes off! You would come across a huge array of bags, cushions, patchworks, mirror works, brocade and embroideries where fabrics of excellent quality are used. Textiles of supreme quality are used to make cozy quilts which are often patterned with embroidery work. These comfortable and light-weight quilts simply give a wonderful sleep. The fabrics of Rajasthan look all the more attractive with the embroideries. By counting threads these embroideries are done by the women folk. Popular motifs include flowers, peacocks and various other animals. Appliqué is also done on the textiles to bring out the exquisite art form of Rajasthan. Cloth pieces of different shapes and sizes are patched together which give the essence of multi-colored mosaic. The quality of fabrics found in Rajasthan is the best you could have! Block printing is that craft practiced in Rajasthan which is done on hand-woven fabrics. This style of printing is done with the help of wooden blocks that are hand-crafted and dyes which are mineral-based. Bandhani is the famous technique of tie-and-dye from Rajasthan. This unique technique has become world-famous by virtue of its artistic excellence. In fact, in Rajasthan, it is one of the oldest forms of adorned textiles. The term Bandhani has been coined from the Hindi term ‘Bandhan’ meaning tying. This technique involves two stages where the first one is tying the sections of a cotton or silk cloth and the second is dunking the same into vessels of color. The chief colors used in Bandhani are red, yellow, green and black. Once the processing gets over, Bandhani work gives birth to a variety of symbols such as squares, dots, waves and strips. The main colors that are used in Bandhani are natural and all the colors are dark. The colors used in Bandhani have strong significance; red symbolizes wedding, saffron is a color worn by a hermit, yellow stands for spring and black and maroon mainly signify mourning. Rajasthan is famous for its leather craft industries. Camel leather items such as shoes, bags, wallets and sandals have gained international fame for their design and elegance. Camel leather products are available in a huge variety of designs and styles so as to everyone’s preference. Camel leather footwear and bags are especially popular among the foreign tourists. In terms of designs and quality camel leather products are great as gift items. Camel leather is known for its durability and hardiness. Jaipur would offer you ample designs, styles and patterns of leather products. In fact, attractive lamps and lampshades are also among the list of camel leather products. The miniature paintings from Jaipur feature stunning characters like Radha-Krishna, Rajasthani women, and also Rajput and Mughal kings. With the use of natural colors derived from vegetables, shells, insects and minerals, the paintings are done by the skilled artists. The end products are adorned with the powders of semi-precious stones and metals such as gold and silver. The most exclusive feature of Jaipur paintings is that even with the passage of time, the color would never fade away. This royal city of Jaipur in Rajasthan has so much to offer to its tourists. Although expensive, but such items are worth purchasing! The artistically woven carpets of Rajasthan offer some of the best traditional designs found all over the world. A number of reputed carpet centers are found all over Rajasthan. In fact, Jaipur is the best of all Indian cities to offer the most exotic carpets and textile works. A huge variety of carpets can be found made of jute, silk, wool and also synthetic fibers. Inspired by the Persian art and culture, soft and opulently embroidered carpets, called ‘Namdas' are made in Rajasthan out of wool; these are usually white in color. Again ‘Jajams' are small carpets or rather mats that are meant for seating. Cotton carpets of Rajasthan are called ‘Dhurries’. Because of the elegance and the ease of maintaining, these are the most popular of all the carpet types. You could also choose from multi-colored carpets of huge ranges of patters and designs which could give your house a completely different look in terms of beauty and sophistication. In order to suit the needs of modern day buyers, Rajasthan's floor covering industry has been revitalized and the carpets are making huge progress in markets both in India and abroad. It is through Kashmir that the art of making glaze blue pottery came to Rajasthan. The attractive Persian blue dye is the source of the name of this art work where this dye is used to color clay pots. The blue pottery made out of Egyptian paste is low-fired and glazed. While most of the potteries are adorned with bird and animal motifs, some are semi-transparent. The range of these fragile items is vast including coasters, bowls, vases, small pitchers, ash trays, boxes, soap dishes, door knobs, hand-painted floral designs, glazed tiles and many more. The color palette for blue pottery is mainly confined to blue or turquoise color which is obtained by mixing rough copper oxide with salt or sugar in a kiln which is subsequently filtered for use. The dark ultramarine color is obtained from cobalt oxide. The shade of green is derived from copper oxide. Sometimes non-conventional colors such as yellow, white and brown are also used. Rajasthan is one of the world’s largest centers for hand-cutting of gems. It is a very significant source in India for precious and semi precious stones such as garnets, ruby, agate, emerald, amethyst, topaz, carnelian, lapis lazuli etc. it is strongly believed that each and every gem bears strong inherent power and can be used as lucky charm with its beauty when worn as a piece of jewelry. Jaipur is the world’s largest center for cutting and polishing of gem stones and it accounts for around 90% of the emerald cutting worldwide and almost 95% of small diamonds processing. 80% of total gems and jewelry exports from India is contributed by Jaipur alone. The superior quality of silver work has made Rajasthan make a strong mark in the field of metalwork. The silversmiths of Rajasthan create products like rose-water sprinklers, match boxes, hukkahs, caskets and silver furniture with exquisite carvings. Silver jewelry and accessories not only look great but can be purchased as exclusive gift items. You could also choose to buy the idols of deities made out of silver which would add to the beauty of the setting where placed.